NEW DELHI: Huawei has launched world’s first core chip specifically designed for 5G base stations, Huawei TIANGANG. Huawei announced the innovative chip that will support simplified 5G networks and large-scale 5G network deployment all over the world. To date, the company has won 30 commercial 5G contracts and shipped over 25,000 5G base stations globally. Huawei is committed to taking complexity itself and creating simplicity for its customers. To this end, the company has invested heavily and continues to innovate. Its end-to-end 5G chips support networks of all standards and all bands (C band, 3.5G, and 2.6G), helping customers access the best wireless and microwave services. At today’s event, Huawei launched the industry’s first 5G core chip, Huawei TIANGANG, with breakthroughs in integration, computing power, and spectral bandwidth. This chip is highly integrated, which means it can support large-scale integration of active power amplifiers (PAs) and passive antenna arrays into very small antennas. It also boasts super high computing capacity, with a 2.5-fold increase over previous chips. Using the latest algorithms and beamforming technology, a single chip can control up to 64 channels, which is the industry’s highest standard. This chip also supports the 200 MHz high spectral bandwidth, getting ready for future network deployment. On January 9, 2019, Huawei’s 5G blade base station was awarded a First Class Progress in Science and Technology Prize, in recognition of its major technological breakthroughs and a unified modular design. All base station units use the blade form factor, and different modules can be combined as needed, making 5G base station installation as simple and easy as building blocks. Today, Huawei also launched the world’s first data center switch with an AI brain. Boasting industry-leading performance, this switch enables zero Ethernet packet loss and end-to-end latency of less than 10 milliseconds. It consumes less than 8W of power while delivering more computing capacity than 25 mainstream two-way CPU servers combined. 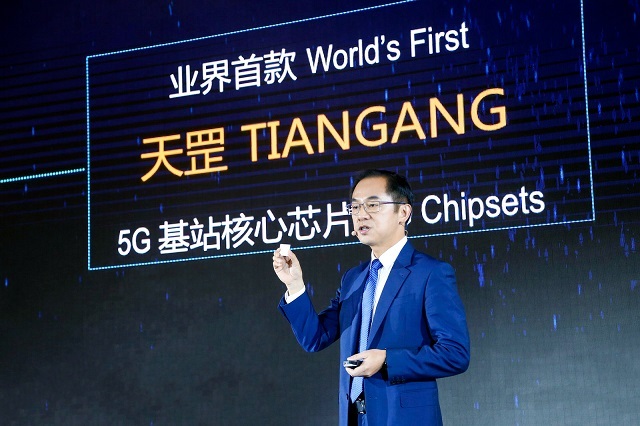 During the event, Richard Yu, Huawei Executive Director of the Board and Consumer BG CEO, also announced the world’s fastest 5G multi-mode device chip and commercial devices.